The time it takes me to write this will take longer than the time it took to create this piece of artwork. But you should read it anyway, because the info you need to know about this piece is inside the following paragraphs. I love Christmas, and it’s not so much the day of itself. There’s so much going on, everyone is buzzing around and energetic. Cities, small towns, down to people’s homes come to life with lights and cheerfulness. There’s a month long anticipation leading up to Christmas Day, which starts right after a great Thanksgiving day feast. To me the joy of Christmas comes from taking the time to think enough about someone you love, and put effort into gifting them something. And it’s always special, because it’s personal when you took so much time out of your own life and made sacrifices to think about that person. But the true happiness of Christmas is being with that loved one. As for finding extra time to do the things we want to do for ourselves during the holiday season, well… I’m sure we can all get a good laugh out of that one. Like many artists, I work a regular full time job to support myself. Taking on extra commissions during this time of year gets a bit scary when you consider the time crunch. So I’ve been playing around with this app on my iPhone called Sketches Pro. I was relaxing with a glass of wine at the bar before I started sketching on Wednesday night, and this is what I came up with. Took about thirty minutes to complete, with goofing around and chatting thrown into the mix as well. 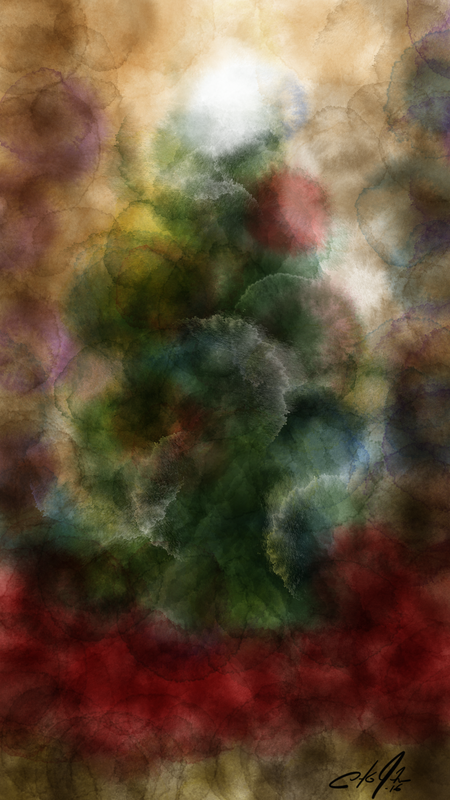 I was sitting beside someone who loves Christmas as much as I do, and when I opened the app to a blank screen to draw… the piece I appropriately named Oh Christmas Tree came together in no time. I used a water color option to make this. I don’t typically enjoy abstract art, but I’ll make an exception this time. Anyway, just something fun. I know I posted a day early, typically I post on Sundays but I will be working and need to get some other pieces aligned for the upcoming week.